Lyle: The country guitar style is a lot like the blues style. Simple chord progressions with not much clutter, just real straight forward grooves. The Lesson Sample is what you'll be learning here in this first lesson, a specific rhythm riff that uses alternating and walking bass lines, and a cool solo guitar riff that emulates the sound and style of the pedal steel guitar most often used in country music. Lyle: There will be three basic chords used for this "country style" riff; C, F, and G7. 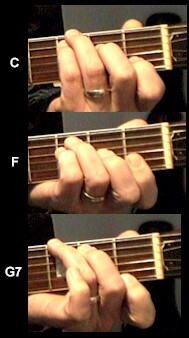 Notice in the C and F chords I'm suggesting you hold down the 3rd and 4th fingers, this will make it easier for you to play the "alternating bass" lines. Lyle: These three chords are also called the 1 - 4 - 5 chords in the key of C. C is the 1 chord, F is the 4th chord, and G7 is the 5th chord in the key of C.
Lyle: Most country style songs are in major keys. The G7 is the 5 chord in the key of C. The 5 chord can be major or the dominant 7 chord like the G7. Lyle: The "7", like the G7, is very common and gives you the extra "twangy" sound compared to using a plain G major chord. Lyle: Once you learn all these little things to practice, I'll put it all together for you. Lyle: Root - strum, 5th - strum, root - strum, 5th - strum. All down strums or strokes. Lyle: The country style lead guitar is mostly done on a pedal steel guitar but you can learn how to get that sound on a regular guitar. Lyle: I like to use my thumb for the 3rd string, index and middle fingers for the other two strings, then pluck all three at the same time. You'll see this technique in the video. Also notice the sound of the bend and release of the bend. Lyle: The riff example you just learned is for the C chord, notice you're at the 8th fret with your pinky, that's where the high C note is. Lyle: Now we just need to put words to this. We have to include the words Mom, train, drunk, truck, and gun. Lyle: ..and dog or horse. Mike: Are there any altered scales you think might sound alright with this? Lyle: An altered scale might give you the jazz sound. And the jazz sound against this type of groove, which is very "un-jazz" and so-country would be hard to fit. Lyle: Keep it simple by using the major pentatonics and you'll do very well. Mike: O.k. pent. are fun. Lyle: That's all for this lesson. In the lessons to come you'll be expanding on these riffs and learning how to play these riffs against different keys. Lyle: Get real good at the bending riff, you'll be using it a lot in the country style. Rich: Thanks I appreciate this. I needed some good explanation on the walking base. Lyle: I think you'll learn a few more like it in the following lessons. Lyle: Ok, well good night pickers, See y'all next week, y'all come back now, ya hear?